WASHINGTON — A woman described as “erratic and aggressive” drove a vehicle into a U.S. Capitol Police cruiser near the Capitol on Wednesday morning and was taken into custody, police said. Shots were fired during the arrest attempt, but the incident appeared to be criminal in nature with “no nexus to terrorism,” said Capitol Police spokeswoman Eva Malecki. No one was injured. She said the U.S. Capitol remained open. Malecki described the woman as an “erratic and aggressive driver.” As police attempted to stop her, she made a U-turn and fled, nearly striking officers and striking at least one other vehicle, Malecki said. A brief pursuit followed before the woman was stopped. 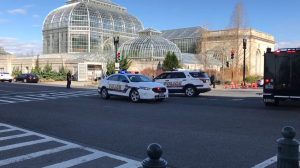 The incident occurred near the U.S. Botanic Garden. Malecki said shots were fired “during the attempt to arrest the suspect,” but she declined to say how many shots were fired or to elaborate further. “We’re not going to get into that right now,” she said. The incident occurred near the end of the morning rush hour and prompted a large police response just as lines of people were waiting to get into a nearby congressional office building. Streets near the Capitol were closed, and the Sergeant at Arms advised lawmakers and staff to stay away from the area. Scott Ferson, president of Liberty Square Group, a Boston-based communications firm, said he suddenly saw a dozen Capitol Police cars moving quickly toward the Botanic Garden. Ferson said he heard what sounded like three gunshots. “I heard pop, pop, pause, pop and I said ‘Oh, that was gunfire,'” he said by phone. Police called to everyone in the area to get off the street, but then things seemed to calm down and he headed to his meeting. And in 2013, Miriam Carey, a 34-year-old dental hygienist from Connecticut, was shot and killed by Capitol Police officers in her vehicle outside the Hart Senate Office Building. Officers had pursued Carey from the White House, where she made a U-turn at a security checkpoint. Her young daughter was inside the car at the time and was unharmed. Her family filed a wrongful-death lawsuit against the Secret Service and Capitol Police. Associated Press writers Ben Nuckols, Kevin Freking and Sarah Brumfield contributed to this report.